When it comes to creating opportunities for professional success, getting into college is just the beginning. Making the most of your college experience will pave the way to not only being employable, but also being well compensated. 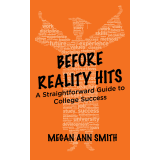 Before Reality Hits: A Straightforward Guide to College Success is the up-front, easy-to-use guide by Megan Ann Smith that provides readers with the information and insight to make your college experience a successful starting point to a rewarding career. From tactics to checklists, this comprehensive resource offers a realistic approach to optimize your college years—before the reality of bills, student loans, and adult life hits. Beginning with college applications, Before Reality Hits takes students through the essential career-making aspects of college, from worthwhile internships to landing that first post-graduation fulltime position. It helps anyone starting out avoid the common pitfalls that many college graduates confront, from mountains of student loan debt to a job that is not in his or her desired career field. Current and future college students, parents of future college students, and anyone thinking about going back to school will find actionable, practical advice that can guide them from the evaluating of potential colleges through the crafting of a resume and beyond. Before Reality Hits reveals how ultimate success begins and ends with you. Hard work, dedication, and planning ahead are the three crucial keys to securing your success. This indispensable roadmap to professional life outlines necessary steps to build the proper foundation—and make college the best possible stepping stone to an incredible future in your desired career field.